Of all the intellectual property rights on which our future prosperity depends, perhaps trademarks are the most undervalued. The deep emotional power of a brand endures, long after its parent has expired. Don't believe me? Well, Palm is coming back. Yes, Palm. Two filings made with regulatory authorities in the US confirm that the brand, licensed by Chinese giant TCL in 2015, will appear on an Android phone very soon. A device named the PVG100 has been certified for use with the tagline "Designed by Palm in San Francisco". The agent, Dennis Miloseski, led the design teams for Gmail and Google Docs, and until 2016 led Samsung's Design Studio in San Francisco, from which a number of stylish wearables emerged. Palm therefore rejoins "BlackBerry" (TCL is also effectively the global custodian of the BlackBerry brand) and "Nokia" as great mid-Noughties mobile titans which expired, only to haunt us in the afterlife. The Pilot became a rapid-seller, but that first flush of success was marred by a split, with the two founders peeling away to create a rival, unhappy that Palm's parent company US Robotics had fallen into the hands of 3Com in 1998. Both Palm and Handspring floated at the height of the dot.com bubble, but weren't reconciled until October 2003. That month Palm became "PalmOne" and launched the Treo 600, for many Americans the first all-singing, all-dancing "smartphone". For US natives ignorant of the latest Sony Ericsson and Nokia's advanced technology - which was most of them - the Treo was bleeding edge. However the now ancient 16-bit OS was unable to cope with the world of 3G, and PalmOne was obliged to launch, through gritted teeth, a Windows Mobile model. The third, "Bono era" was short-lived. The VC company backed by the gurning Irish messiah, Elevation Partners, poured almost half a billion dollars into the operation, creating a new smartphone rival to the iPhone. But like the original Palm, this incarnation of Palm ran low on capital and had to seek a buyer. Elevation (and Bono) saw a small profit after HP snapped it up. 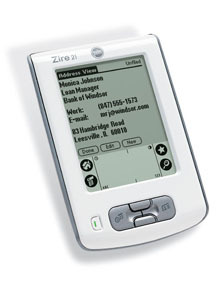 Palm's WebOS pioneered many ideas subsequently stolen by today's duopoly - as you can see here. The very cool WebOS part of the deal now belongs to LG, though. A year ago TCL vowed [translation] to revive the Palm brand with nostalgics in mind - and Verizon is tipped to be the launch network.